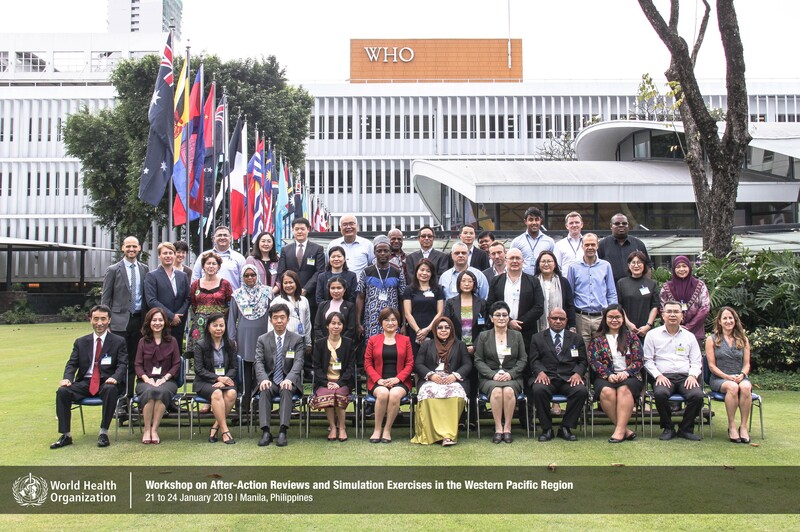 The WHO Regional Office for the Western Pacific organized a workshop to review how after action reviews and simulation exercises contribute to the strengthening of health systems through the implementation of the Asia Pacific Strategy for Emerging Diseases and Public Health Emergencies (APSED III). A total of 26 participants from 10 countries, representing both Ministries of health and WHO country offices, participated in the 4-day workshop that took place from 21-24 January 2019 in Manila, Republic of the Philippines. Participants at the workshop were exposed to WHO tools and methodologies for planning, designing and conducting effective after-action reviews and simulation exercises in order to advance country capabilities in public health preparedness and response. They also identified potential events or emergencies including natural disasters that can be considered for AAR or SimEx in the region in the near future.